Heartland Health Research Institute (HHRI) will soon be releasing the first-of-its-kind study in Iowa about the prevalence of medical errors reported by Iowans. 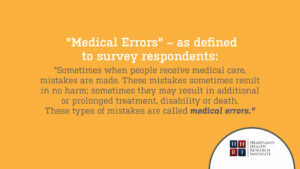 Prior to this survey, there was little information specific to Iowa regarding the experience of medical errors and how Iowans view this problem. Here are some common questions concerning the purpose of this study and what we can learn from it. What is the intent of this Survey? Medical errors represent a serious public health problem and pose a threat to patient safety. This survey of Iowa adults, ages 18+, is designed to assess awareness, attitudes and behaviors related to patient safety in Iowa. What type of information will be collected from this Survey? Iowans’ real-life experiences with patient safety/medical error issues. Were Iowans who experienced a medical error informed of the error? Did Iowans who experienced a medical error report the error? Does the Iowa public seek information about patient safety before receiving care? How Iowans choose hospitals for care. Public attitudes about patient safety/medical error problems in Iowa. Do Iowans support greater reporting requirements on patient safety? Why is this Survey important? If the Centers for Disease Control (CDC) were to include preventable medical errors in hospitals as a category, it would be the third-leading cause of death in the United States, behind heart disease and cancer. In 2016, HHRI estimated the range of lives lost in Iowa hospitals due to preventable medical errors was 960 to 4,300 – with 2,440 being the mid-range estimate. Additionally, HHRI estimated between 64,500 to 112,200 patients are seriously harmed in Iowa hospitals due to preventable medical errors. The public’s view on preventable medical error issues is critical to garner support for healthcare delivery improvements and public policy changes in Iowa. To our knowledge, no similar survey has ever been performed in Iowa. Consequently, the results will serve as a vital baseline from which to share any future progress on reducing medical mistakes. Quite obviously, a patient’s voice is both necessary and relevant. When combining a large number of patient voices together, their collective voice will forcefully magnify this alarming issue. Without question, we are all personally impacted by the medical care we receive today, tomorrow or sometime in the future – whether the care is for ourselves, a loved one or a friend. As an employer, the safety of your employees and their dependents greatly impacts your organization, both in productivity and in cost. Medical care must be delivered consistently, appropriately and transparently by using the best practices known at the time it is delivered. Above all, care must be delivered safely. A medical error is a preventable adverse effect of care – whether or not it is evident or harmful to the patient. This can include an inaccurate or incomplete diagnosis or treatment of a disease, injury, syndrome, behavior, infection or other ailment. Don’t we already know about medical errors in Iowa? Yes and no. We do know that preventable medical errors occur with alarming frequency in our country, and certainly exist within the Iowa healthcare delivery system. However, we have little evidence on the extent errors occur and whether these mistakes are consistently and fully reported to the public. Some hospital systems and clinics maintain records on medical mistakes that occur within their facilities. But, unfortunately, when seeking appropriate care and assessing provider outcomes, this crucial information is silently withheld from the public. Are there federal and state requirements to report medical errors? Currently, each state decides whether to develop mandated reporting requirements on medical errors. Iowa does not have such a requirement. In fact, there are limited federal mandatory reporting requirements on medical errors by hospitals and clinics. In addition, there is no nationwide reporting system to publicly report medical mistakes. According to a USA Today article in August 2014, the federal government has quietly discontinued public disclosure of many serious hospital errors. Results from the Iowa Patient Safety Study: Iowans’ Views on Medical Errors is expected to be released soon.